20 The Hebrews didn’t kill Jesus. At todays Catholic mass we read John 8:4-11 about the woman caught to be adulterous and sentenced to death by lapidation according to the Mosaic law and Jesus view on this case. Jesus knew that God does not want use dead sinners but alive sinners that will have the possibility to convert. Caiaphas the highest priest in Jerusalem may have written a report to Pilate with the charges behind the Jesus death sentence. This report is to be found in the so called archko volumes created by William Dennes Mahan, a American prebitarian priest. Because of this book he was convicted by an ecclesiastical court of falsehood and plagiarism. Mahan was therefore convicted and suspended from the ministry for one year. (Wiki ) So we can not be sure that Caiaphas reports in the archko volumes aregenuine documents. These reports may however bring some idea about who really sentenced and killed Jesus. 18 % of Italians believe that the Hebrews killed Jesus. The Caiaphas reports tells me not to agree with these Italians. Jesus does not suggest a change to the law about adultery. He opposses on how and by whom the sentence is executed. Jesus was presumably without sin and could have trown the first stone but he didn’t. He understood that God does not want dead sinners but sinners alive to be able to convert. He alway emphasized on the existence of a understanding, tollerant and forgiving God. That was not the God of the Hebrews. His action was not liked the the priesthood in Jerusalem. Caiaphas gives a reasonable explanation in his report why the priesthood did not like this kind of tollerant and forgiving God. The report is to be found inThe archko volumes pu together by William Dennes Mahan as said in my introduction Mahan was convicted by an ecclesiastical court of falsehood and plagiarism. he obviously copied a short story by Joseph Méry published in Revue de Paris in 1837 and a novel from ben-Hur Mahan was therefore convicted and suspended from the ministry for one year. (Wiki ) Mahan tells in the first chapter that he got part of the documents from a German called Whydaman who said he visited the Vatican library and got documents there. Mahan says he went himself later to the Vatican library and to the lbrary in Constantinople. “The archkovolumnes is a series of reports from Jewish and pagan sources contemporary with Jesus that relate to the biblical texts describing his life. The work went through a number of versions and has remained in print ever since. The texts are otherwise unknown, and the author was convicted by an ecclesiastical court of falsehood and plagiarism.” ( Wiki and E.J. Goodspeed, Modern Apocrypha (Boston: Beacon Press, 1956), 40. ) So the texts in this book must be read with this in mind. Some or all of it may be fiction..
First, with teaching the doctrine that there are more gods than one, which is contrary to the teachings of the Jewish law, which he most positively refuses to desist from in the presence of this court. Second, he teaches that he is a God, which is contrary to the Jewish law, and he is visible and comprehensible ; and, after being asked to desist by this court, he most positively affirms that he is the Son of God. Third, he teaches and affirms that the Bath hole (Holy Spirit) cannot come until he goes away, which is contrary to the teachings of the Jews ; because it was He that brooded over the waters, and has been in the habitual light of the world ever since ; from all of which he refuses to desist. He teaches baptism as the seal of God, instead of circumcision, which was established by the decrees of God with Abraham as a seal of the Jews ; and when abjured to desist by this court declared he would not. 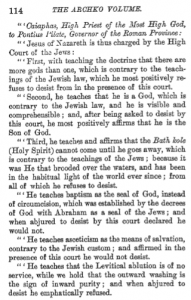 He teaches asceticism as the means of salvation, contrary to the Jewish custom ; and affirmed in the presence of this court lie would not desist. He has abrogated the ordinance given by God to Moses of the pascal supper, wherein we should roast a lamb and eat it with unleavened bread ; but Jesus has introduced a custom altogether different without any authority. I find the report of Caiaphah to be supported in the Gospels According to this doc you can see that the Adulterous case never ended up in a charge. Caiaphas was in the report very negative to the view of a forgiving God that he defines as week. Quite areasonable view for a Hebrew believing strongly in a old testament eye for an eye God. But I didnt expect the description of Jesus as made in his “concerning the resurrection report” in chapter 7. In the report it is clear that the sentence and execution of Jesus was requested by the priesthood and the Romans as they saw in Jesus a istigator and leader of a resurrection. Many Hebrews followed Jesus and thousands were at the execution asking why he was sentenced. I dont think that this help those who think that the Hebrews killed Jesus. I advice instead to look closer at this report to see if there is a genuine original in the Vatican Libaary as Mahan claimed 100 years ago.